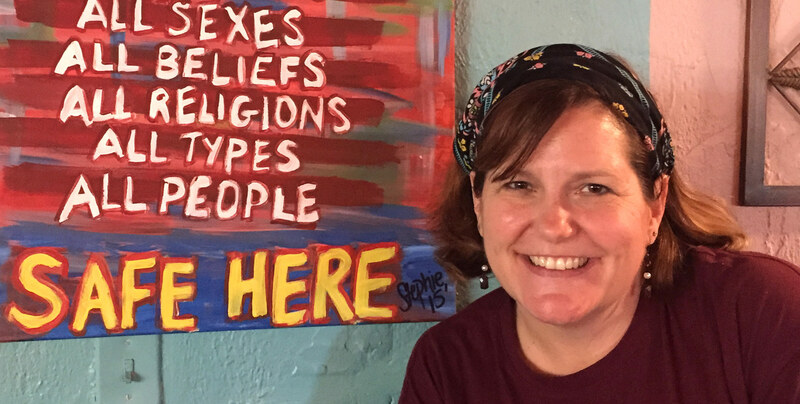 A vibrantly colored sign at The Local Buzz in Rosewood welcomes “all sizes, all colors, all ages, all cultures, all sexes, all beliefs, all religions, all types, all people – safe here.” Stephanie Bridgers painted the sign and runs her coffee shop by this creed. Customers’ personal coffee mugs fill the walls near the door, and a young boy tips at his toes anxiously awaiting the brownie across the counter at The Local Buzz, a coffee shop that owner Stephanie Bridgers calls a community cafe. The Local Buzz owner Stephanie Bridgers painted this sign to make sure everyone knows her Rosewood coffee shop is a safe space. By Bridgers’ design, it’s a safe place, tucked into the corner of a strip shopping center at South Shandon Street and Rosewood Drive across from the Rosewood Dairy Bar. It’s by design because two of Bridgers’ four children have autism, and Bridgers says she understands what it’s like to sense you’re being judged, even if only slightly. “I want it to be a treat for parents and kids to come here and have things like organic ice cream and the experience to be sincere in a time where going somewhere with a drive-thru is common,” she says. Owner Stephanie Bridgers and regular customer Debbie McDaniel often chat across the counter at The Local Buzz. McDaniel became a regular after her father passed away and she had to put her mother in a memory loss clinic. She says she always feels welcome. Debbie McDaniel, who owns Revente and Sid and Nancy’s clothing in Five Points and lives in Rosewood, has become a regular. After her father’s death and her mother’s move to a memory care facility, McDaniel says she comes for the chatter and warm environment. “This is the place where I can get a hug and meet new people,” she says. Bridgers’ son Sam, now 15, was diagnosed with autism in 2003 at age 2. Her son Eli, now 13, was diagnosed a year later at 18 months old. “When Sam was diagnosed, I felt it as a loss because dreams and plans changed,” says Bridgers, who had been a stay-at-home mom for 13 years taking care of very young Sam and Eli as well as her oldest son, Alex. Bridgers then spent nine years as a program coordinator at Family Connections of South Carolina, which helps parents of special needs children find mutual support. “I just wanted to share my story with parents, but in a formal way,” she says. Autism Speaks provides resources to learn more about autism and to help those with autism or who care for someone with autism.This is the S.C. directory. The Local Buzz’s website offers menu and drink options as well as event updates.. The Local Buzz’s Facebook page.“Checking in” gets you 10% off your purchase. Read about some of the challenges in opening a coffee shop in this Specialty Coffee Association of America article. .
See a sample business plan for a coffee shop on Bplans, a site that sells the ability to write business plans online but also has some free tools and some additional business plans. But in 2015, she decided it was time to take the plunge into business. Bridgers recalls a Friday afternoon. Her husband, Michael, came home, and she sat him down. “What are my passions?” she asked. “Hospitality and helping parents of children with special needs,” he replied. The lease on The Local Buzz was signed two weeks later. Matthew Wright, who has worked at The Local Buzz since it opened, says Bridgers always makes sure everyone on staff is extra friendly and asks about people’s days. “We try to remember all our customer’s names,” he says. Bridgers, 46, was a business and nursing student at USC 20 years ago, but this is her first business. The name comes from Hawaii’s Local Buzz coffee farm on which Alex now works. She says her toughest challenges are controlling food costs, advertising and finding ways to include diverse parts of the community while keeping a target market in mind. “There’s no booklet for this, and it’s a lot more than just baking and pouring coffee,” Bridgers says. She avoided showroom furniture and its cold, commercial feel. Most of the pieces, like couches and recliners, come secondhand from thrift stores or friends across the state to give the cafe a personal, inviting and true community feel. “Friends who have their stuff here come in and are always interested in where I hung their pieces,” Bridgers says. USC students Breanna Reardon, left, and Maggie Moakley come to study at The Local Buzz. They say the relaxing atmosphere pairs well with hitting the books. Reardon also is dairy-free, so Bridgers’ vegan desserts caught her attention. Children’s artwork, vintage ads and photos fill the walls alongside shelves of donated books and board games. Little 3-D snowflakes and dim lighting fixtures hang from the ceiling. Bridgers has donated part of the proceeds from specially promoted days to organizations like the Autism Academy of South Carolina and Epworth Children’s Home. And she has hosted events like Autism Awareness Day on April 2. But Bridgers says her biggest motivation has nothing to do with the money but in seeing people come together and enjoy the space she has provided.